Are you communicating effectively through your blog articles? You have asked and we are answering your grammar questions. Lately, we have been publishing articles demystifying grammar topics. One thing that I have found really interesting and really fun is that with every grammar article we publish, one of our faithful readers posts a new question about grammar. My guess is that the reason why these articles are prompting your questions is that, while we have all learned about grammar in school, the truth is the English language is complicated, and we all want to be great writers. Being a great writer isn’t simply about being creative or even knowing what kinds of topics your readers are interested in. It is also about being able to communicate well. That is true of just about everything. You can have all the talent in the world, but if you can’t communicate it, you are stuck. Great communicators are often great leaders and great influencers. Recently, I have been watching a documentary about President Franklin Roosevelt, and it is truly amazing how great of a communicator he was. He led our nation during one of the most turbulent times of the world’s history. Believe it or not, but good grammar is essential to great communication especially in the blogging world. 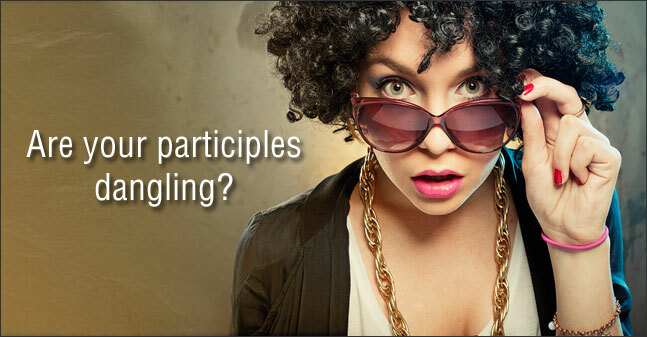 The grammar-related question we are answering today is about dangling participles. Now before you roll your eyes and stop reading because you really don’t care what a dangling participle is, when you write a sentence that has a dangling participle in it people will notice. They will notice, even if they don’t know what dangling participles are. When they notice they may even smile because they know your sentence doesn’t make sense. Before you think it’s easy to avoid dangling participles, check out the following writers who have all done it. So take a deep breath and keep reading. Let’s start at the beginning. According to Oxford Dictionaries, a participle is a verb that in this case is used to introduce the subordinate clause. The subordinate clause is being used to give extra information about the main clause; the main clause is the main part of the sentence. Participle: A verb used to introduce the subordinate clause. Subordinate clause: gives extra information about the main clause. Main Clause: The main part of the sentence. Here is the key: The participle always describes the action being performed by the subject of the main part of the sentence. Present participles always end in -”ing”. Here are a few examples on how participles should be used. Mrs. Stevens, opening the door quietly, came into the room. In these examples: floating, biting, and opening are all the participles because they are referring to the subject of the main clause. The intended subject is me because “me” is sleeping. However, the way this sentence is worded, sleeping, the participle, ends up describing the serpent instead of me. You can fix this and ensure you are not dangling participles by making sure you have the proper subject in the sentence. The subject will most often follow right after the participle or participle phase. One of the reasons President Franklin Roosevelt was such a great communicator was displayed in his “fireside chats”. During those chats he would break down his reasoning for social change in a way that the average American could understand. When you dangle your participle, you assume that the reader knows and understands who the subject is. I highly doubt that President Franklin Roosevelt ever did that. Does this help to demystify what a dangling participle is? Have a wonderful week and happy blogging! It still is confusing. The words and examples make sense, yet when writing I might not notice if I create a dangling particible. I envy those bloggers who have a knack or interest in grammar. Not me. Oh man, it’s really tough, isn’t it? I know I had to read and reread my research and then practice explaining it over and over to people before I felt like I had a good grasp on the term. I think though, the most important thing to take away from this article is the importance of communicating effectively and clearly in your blog articles. If you are worried dangling your participles just check for it when you are proofreading. Thanks so much for letting me know Roslyn. 🙂 Have a wonderful day.